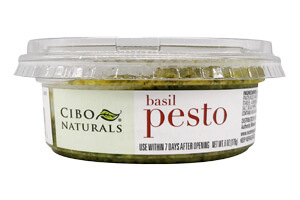 This basil pesto is just a tiny bit different from the classic version; it is made with almonds instead of pine nuts. Made with fresh ingredients, this versatile product adds a spectacular flavor and texture to a variety of dishes; for every day, simple meals as well as the more fancy dinners. You can keep this product 40 days from thaw. Ingredients:basil, expeller pressed canola oil, parmesan cheese (pasteurized part-skim milk, cheese culture, salt, enzymes, potato starch), almonds, extra virgin olive oil, garlic, rice vinegar, sea salt, black pepper.